Flexibility value has become much more important in European gas and power markets over the last few years. This is because of an increasing prevalence of assets with ‘at the money’ and ‘out of the money’ optionality. Quantifying and extracting the value of asset optionality depends on the monetisation strategy adopted by the asset owner or investor. In this article we explore the 5 most common strategies. Flexibility value is a term often loosely used in association with gas and power asset optionality. It is a simple and widely accepted principle that asset flexibility has an associated value. But the practicalities of quantifying and monetising this flexibility value are often more complex. Flexibility value has become much more important in European gas and power markets over the last few years. This is because of an increasing prevalence of assets with ‘at the money’ and ‘out of the money’ optionality. For example most European gas-fired power plants have a variable cost at or above wholesale power price levels. Gas storage capacity has ‘at the money’ value characteristics given the weakness in seasonal hub price spreads. Similar logic applies for LNG supply contract diversion rights given regional spot price convergence. Quantifying and extracting the value of asset optionality depends on the monetisation strategy adopted by the asset owner or investor. There are a range of monetisation strategies that are commonly applied which are distinguished by level of sophistication and risk/reward trade off. These include passive contracting strategies as well as more dynamic hedging and optimisation strategies. In this article, the first in a series on value monetisation, we summarise five common strategies applied to the monetisation of flexible assets, using practical examples as an illustration. Then in subsequent articles we will undertake a comparison of the pros and cons of each of these strategies. We will also explore practical considerations in developing an appropriate monetisation strategy for a specific asset or portfolio. The five most common strategies for hedging and optimising flexible assets are summarised in the table below, followed by a summary description of each. We use the term ‘assets’ in a broader sense to capture physical infrastructure as well as contracts. Some of these strategies are more commonly applied than others given more palatable risk/reward characteristics. However we describe a full spectrum of strategies to highlight contrasting approaches. Chart 1 then illustrates a stylised comparison of risk/reward tradeoffs across the five different strategies (something we will revisit in more detail in the next article in this series). In many ways the purest asset monetisation strategy is optimisation of an asset against current and expected future spot price levels. Under this strategy no forward hedging is undertaken. The advantage of this is that there are no associated hedging costs. The disadvantage is the strategy results in a relatively wide distribution of asset returns (i.e. higher earnings risk). This strategy is often implemented out of necessity rather than choice. This is the case for ‘out of the money’ assets e.g. gas peaking plant or for assets with a high proportion of extrinsic value e.g. very fast cycle storage assets. In both cases, hedging beyond the prompt period (i.e. close to dispatch) is difficult. Implementation of a spot optimisation strategy requires a strong stochastic asset modelling capability to analyse price behaviour and decisions on exercise of asset optionality. This is particularly the case with assets which have more complex inter-temporal flexibility (e.g. gas swing / storage). In addition a capable prompt trading function and associated supporting functions, systems and processes are required. A pure spot optimisation strategy represents one extreme of the value monetisation spectrum. But in practice, spot optimisation is usually matched with some form of forward hedging where possible. The other end of the value monetisation spectrum is represented by the static intrinsic strategy. This is a simple strategy where the asset is optimised and hedged on a ‘one off’ basis. This strategy is focused on locking in intrinsic value. It does not allow capture of extrinsic value and is subject to market timing risk. The strategy is therefore limited in its application. The advantage of a static intrinsic strategy is that it requires very little commercial organisation capability beyond a basic operational support function and back office. It also has a relatively low associated earnings risk (e.g. residual availability and credit risk). This strategy was historically applied in the classic project finance structures for early independent power projects, read this post here for you to know what strategy and other stuff about your funds and how you finance your business. It is still occasionally used for ‘deep in the money’ assets with little extrinsic value. However the management of intrinsic asset value is typically accompanied by some form of static or dynamic strategy to facilitate the capture of extrinsic value. This strategy is a variation of the static intrinsic approach, but one which enables up front monetisation of asset extrinsic value. This is achieved by selling asset optionality to a third party (assuming a buyer can be found). The strategy can be executed on a one off basis e.g. signing a long term tolling contract on a CCGT asset, or as a series of contracts e.g. a storage asset owner selling capacity contracts of different durations/configurations on a single asset. The strategy can be implemented either on a physical contract basis or using ‘virtual’ or ‘synthetic’ deals. It may also be adopted in response to a regulatory requirement where asset Third Party Access (TPA) is mandated e.g. for gas transportation capacity and some storage assets. The strategy is attractive in that there is generally a relatively low residual earnings risk over the horizon for which the asset is contracted. Although residual risk may increase with more dynamic capacity sales strategies, e.g. depending on contract timing and the degree to which the owner retains market risk. This strategy is very common for more risk averse asset owners such as independent producers or smaller portfolio players. Implementation requires a commercial support capability (e.g. sales strategy / product development). But importantly it does not require a trading capability (and associated cost/complexity). Given the costs and risks of extrinsic value monetisation sit with the contract counterparty, the asset owner will often incur a substantial value discount. Probably the most common strategy adopted for monetisation of flexibility value is the rolling intrinsic strategy. Asset flexibility is optimised & hedged against the forward curve, with the owner ‘rolling’ or adjusting hedges if better opportunities present themselves. In other words re-optimisation and hedge adjustment is only undertaken if profitable (i.e. adjustments are risk free). Most importantly it enables the capture of some extrinsic value on an ongoing (rather than a one off) basis. The owner does not retain any downside market risk as the intrinsic hedges are only unwound if profitable adjustments can be made to the strategy. This reduces the market timing risk problem associated with the static strategies (2 & 3). But it means that the asset owner retains some earnings variability, given access to upside is a function of market price dynamics. A rolling intrinsic strategy requires an active trading capability. But it does not require sophisticated dispatch and hedge modelling. The strategy represents a practical way of extracting extrinsic value while limiting downside earnings risk. As a result it is a very common strategy employed to monetise value of power, gas and LNG assets. This is particularly the case in illiquid markets where significant transaction costs can be cleanly accounted for when identifying profitable adjustments. 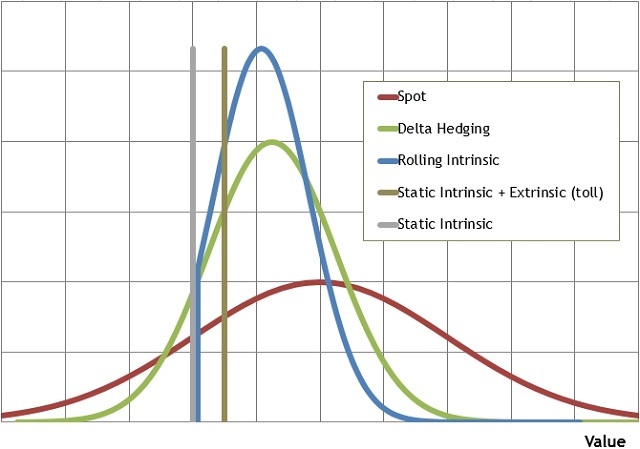 The delta hedging strategy is a more sophisticated approach for the dynamic hedging of asset optionality. Asset flexibility is optimised against current & expected future spot prices as for the spot optimisation strategy (1.). But in this case, probabilistic forward ‘delta’ exposures are also calculated and hedged using linear products (i.e. fixed price/volume futures or forwards) in the underlying market. The delta hedging strategy can be described using a simple CCGT example. Asset dispatch is optimised against spot power, gas and carbon prices (e.g. via the day-ahead or within-day markets). But in addition a probabilistic calculation of forward ‘delta’ sparkspread exposures is undertaken across the time buckets of available traded contracts. This is typically deconstructed into the gas, power and carbon legs that can be liquidly traded. The forward delta exposures are then hedged and hedges are dynamically adjusted as deltas change with market price movements. The benefit of a delta hedging strategy is that it targets capture of the ‘full’ option value of an asset, whilst reducing earnings risk when compared to a spot optimisation strategy. But the owner still retains exposure to downside market risk as asset exposures are not fully hedged until delivery. However, successful delta hedging requires a capable and experienced trading function and a sophisticated analytical capability (e.g. to calculate forward delta exposures). It is also not suited to all assets in all market conditions. Delta hedging requires relatively stable delta exposures and reliable market liquidity. But most importantly, theoretical or modelled value can be killed by market transaction costs. This means the successful implementation of delta hedging requires the combination of sophisticated but practical commercial and analytical expertise. In our next article in this series we come back and undertake a more detailed comparison of the pros, cons and pitfalls associated with these five strategies. Strategy application is typically a case of ‘horses for courses’. No one strategy is best and in many cases the actual monetisation strategy adopted may be a combination of several strategies, particularly in the case where the asset sits within an integrated portfolio. This means it is important to pro-actively develop a monetisation strategy that is tailored to the risk/return tolerance and organisational capabilities of the asset owner.